Jerusalem is ground zero for Bible history, end-time prophecy and a beautiful, peaceful future to come. Here’s what you need to know about the Holy City. From my balcony perch one Friday evening just before sunset, I gazed down on the hundreds of Jews gathering at the Western Wall of the Temple Mount in Jerusalem to usher in the Sabbath. The camera I was holding silently told the story and explained the problem. Slowly tilting up, then panning to the left, the scenes shifted dramatically. First, the Jewish worshippers at their revered wall, then up to the Muslims’ golden Dome of the Rock mosque, then to the silhouetted domes and crosses of Christian churches only a stone’s throw away. At first, I had simply wanted to capture a nice panoramic shot. But then I realized the camera was catching the essence of the paradox—and the problem—that is Jerusalem. In this tiny one-square-kilometer portion of land known as the Old City, those iconic religious images stand symbolic of the deepest religious, cultural, political, social, historical and ethnic conflicts facing humanity today. Jerusalem is arguably the greatest paradox on earth! If any city evokes images of disunity and division, as well as unity and peace, it’s Jerusalem. If any city evokes images of disunity and division, as well as unity and peace, it’s Jerusalem. If any city pictures historical suffering, it’s Jerusalem. If any city portrays future healing, it’s Jerusalem. More than anywhere else, Jerusalem embodies at once the human capacity for hatred and the godly capacity for love. Even the Bible characterizes it in extremes as both sacred—“the holy city” (Isaiah 52:1)—and the epitome of sin—“Sodom and Egypt” (Revelation 11:8). And how many visitors have pondered the sad irony that these three great world religions—all claiming to represent God, all claiming Jerusalem as a holy site—have mostly inflamed, rather than resolved, the tensions here? Actually, religion’s role in Jerusalem’s history presents another paradox. Despite its violent history, it was in the “City of Peace” that many of God’s prophets proclaimed a coming time when God would give peace, love and harmony to Israel, and from there to the rest of the world. But in a scathing rebuke of the religious leaders of His day, Jesus lamented, “O Jerusalem, Jerusalem, the one who kills the prophets and stones those who are sent to her! How often I wanted to gather your children together, as a hen gathers her chicks under her wings, but you were not willing! See! Your house is left to you desolate” (Matthew 23:37-38). Just a few days later, it was where He—the greatest Prophet and voice for peace—was violently murdered, giving His life to atone for the sins of the world. And perhaps the greatest paradox lies yet ahead, when Christ returns and Jerusalem abruptly turns from being the focal point of pending world destruction to the centerpiece of world peace! Many of the 800-plus references to Jerusalem in the Bible show how it figures prominently in the events that usher in the coming return of Jesus Christ and His millennial rule. Among them are some incredible prophecies recorded more than five centuries before Jesus’ birth that God gave to His servant Zechariah. Describing the politically central position and troublesome nature of the city in the end time, He foretold: “Behold, I will make Jerusalem a cup of drunkenness to all the surrounding peoples. ... I will make Jerusalem a very heavy stone for all peoples; all who would heave it away will surely be cut in pieces, though all nations of the earth are gathered against it” (Zechariah 12:1-3). But in the last century especially we have certainly seen the “heavy stone” part of this prophecy come to fulfillment as Middle East tensions, centered in Israel and Jerusalem, have weighed down government leaders. They clearly understand the perilous ramifications of conflict there, knowing it could spill over to affect the entire world. Prophecy shows that is indeed what is going to happen—the stone is only going to get heavier. Every time violence flares in Jerusalem today, those who understand the volatile nature of the Middle East wonder whether this might be the match that ignites the bomb. Even when tempers cool and enemies back off, the wedges of enmity seem to have only been driven deeper. Walking the streets of the city today, one senses the frustration and anger always simmering under the surface of everyday life. How do we know the “heavy stone” problem is going to get worse? Because the part of Zechariah’s prophecy of “all nations of the earth” being “gathered against” Jerusalem is yet unfulfilled. In one of the Bible’s most important prophecies, Jesus elaborated on this when His disciples came “as He sat on the Mount of Olives” overlooking Jerusalem and asked Him specifically, “What will be the sign of Your coming, and of the end of the age?” (Matthew 24:3). Jesus answered in detail, listing numerous signs and events to watch for, among them this explicit statement: “But when you see Jerusalem surrounded by armies, then know that its desolation is near” (Luke 21:20). What leads to this crisis? Other prophecies, especially in Daniel and Revelation, foretell the rise of a superpower coalition of 10 nations embodying the nature of the ancient Roman Empire, which will play a central role in end-time world events. This union of nations grows formidable on multiple fronts—economic, religious, political and military—exerting such tremendous influence that conflict with opposing forces becomes inevitable. In addition, most people will be completely unaware of the most dominant force working behind the scenes—Satan the devil, “the prince of the power of the air, the spirit who now works in the sons of disobedience” (Ephesians 2:2). God, too, will be at work, giving supernatural power to His “two witnesses” for 3½ years to powerfully oppose the Antichrist and proclaim God’s truth to the world (Revelation 11:3-12). Once again, all eyes will be on Jerusalem as these two men meet a brutal death at the hands of their enemy and “their dead bodies … lie in the street of the great city which spiritually is called Sodom and Egypt, where also our Lord was crucified” (verse 8). A rejoicing world soon recoils in terror, though, as 3½ days later it sees them suddenly come back to life and ascend into a cloud! These events culminate the time Jesus called “great tribulation, such as has not been since the beginning of the world until this time, no, nor ever shall be” (Matthew 24:21). The threat to humanity will be so severe, He added, that “unless those days were shortened, no flesh would be saved; but for the elect’s sake those days will be shortened” (verse 22). Do you see why, moments later, Jesus gave this warning? “But take heed to yourselves, lest your hearts be weighed down with carousing, drunkenness, and cares of this life, and that Day come on you unexpectedly. For it will come as a snare on all those who dwell on the face of the whole earth. Watch therefore, and pray always that you may be counted worthy to escape all these things that will come to pass, and to stand before the Son of Man” (Luke 21:34-36). Numerous prophecies describe what happens next, but let’s look again at Zechariah’s account of the coming “day of the Lord.” God says, “I will gather all the nations to battle against Jerusalem. … Then the Lord will go forth and fight against those nations, as He fights in the day of battle” (14:2-3). The battle will be short, fierce and one-sided, as you can read in more detail in Revelation 19. It, too, stands as another great paradox of human history—in order for the Prince of Peace to bring an end to man’s violence and strife, He has to “destroy those who destroy the earth” (Revelation 11:18). I began this article describing a Friday evening sunset at the Western Wall. That Sabbath morning, I stood a few hundred yards away on a hillside, contemplating another scene far more inspiring. Zechariah described the return of Christ this way: “And in that day His feet will stand on the Mount of Olives, which faces Jerusalem on the east. And the Mount of Olives shall be split in two, from east to west. … Thus the Lord my God will come, and all the saints with You” (14:4-5). “And in that day His feet will stand on the Mount of Olives, which faces Jerusalem on the east. And the Mount of Olives shall be split in two, from east to west. … Thus the Lord my God will come, and all the saints with You.” Standing on that same Mount of Olives and trying to drink in all that is Jerusalem—from its remarkable 3,000-year past to its eternal future as the capital of God’s Kingdom—is almost overwhelming. And it would be depressing, except for God’s assurances! He promises Jerusalem will someday become the capital city of a world government—not Israeli or Palestinian, not established by the United Nations or any human organization, and not even of any of man’s religions—but one pure government and religion established by Jesus Christ. In another of Zechariah’s wonderful prophecies, God promises, “I will pour on the house of David and on the inhabitants of Jerusalem the Spirit of grace and supplication; then they will look on Me whom they pierced. Yes, they will mourn for Him as one mourns for his only son and grieve for Him as one grieves for a firstborn” (12:10). 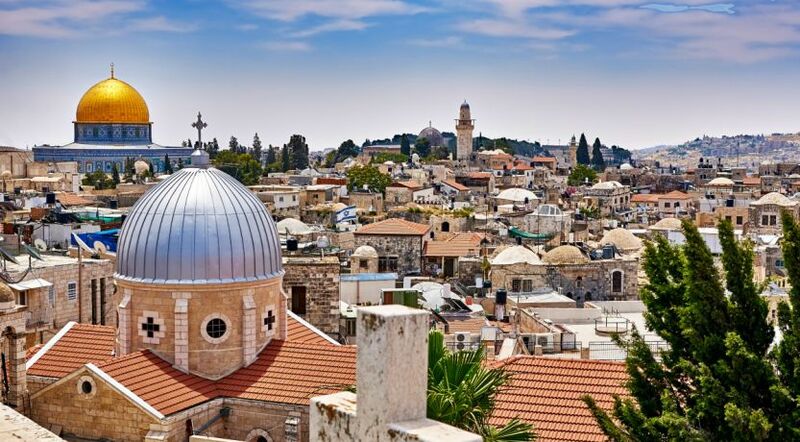 Despite its being a “holy city,” very little grace has ever been at work in Jerusalem. Divine spiritual favor isn’t working in the hearts of Arabs and Jews (or anybody else) powerfully enough to bring these feuding cousins together and overcome millennia of strife and bloodshed. It will take an act of God to lead humanity to repent, as Zechariah describes, and to be willing to forgive others as they have been forgiven. It will take an act of God for humanity to learn to practice love toward all without prejudice. It will take an act of God for all to accept Him as the one true God and to start living by His Word. It will take an act of God to bring a perfect universal government for all people, and for people to submit to it. Such a government must be devoid of selfish leaders driven by ignorance, envy, greed and revenge. The history and future of Jerusalem testifies to Jesus’ words: “With men this is impossible, but with God all things are possible” (Matthew 19:26). With Christ’s return, a tired and downtrodden Jerusalem will find its rest and rescue. It will finally earn its intended status as a font of light, truth and glory, the capital from which Jesus Christ will liberate mankind and bring peace to our war-torn world. Zechariah also recorded this promise from God: “Thus says the Lord: ‘I will return to Zion, and dwell in the midst of Jerusalem. Jerusalem shall be called the City of Truth, the Mountain of the Lord of hosts, the Holy Mountain’” (8:3). May God speed that day—for Jerusalem and the entire world!